Subnets hosting various tiers of a multi-tiered application. For more information, see Network Performance Monitor. 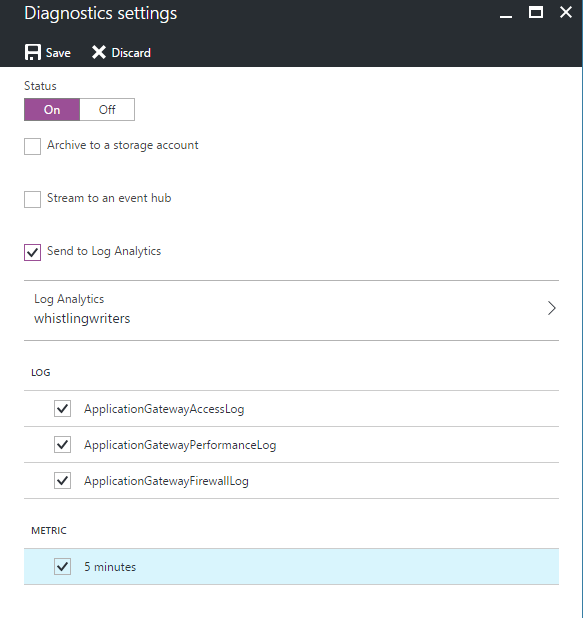 Enable diagnostics to direct the diagnostics to a Log Analytics workspace in Azure Monitor. It is not necessary to write the logs to Azure Blob storage. You can enable diagnostics and the corresponding solution for either one or both of Application Gateway and Networking Security Groups. If you do not enable diagnostic logging for a particular resource type, but install the solution, the dashboard blades for that resource are blank and display an error message. In January 2017, the supported way of sending logs from Application Gateways and Network Security Groups to a Log Analytics workspace changed. If you see the Azure Networking Analytics (deprecated) solution, refer to migrating from the old Networking Analytics solution for steps you need to follow. 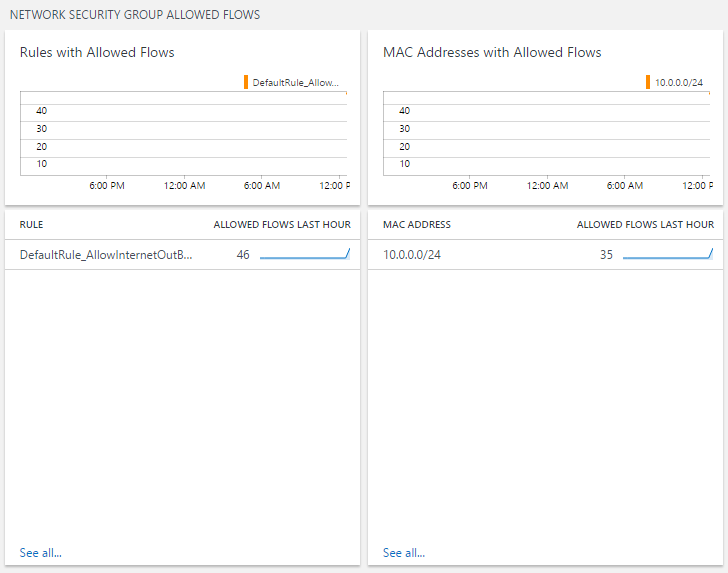 The Azure Application Gateway analytics and the Network Security Group analytics management solutions collect diagnostics logs directly from Azure Application Gateways and Network Security Groups. It is not necessary to write the logs to Azure Blob storage and no agent is required for data collection. The following table shows data collection methods and other details about how data is collected for Azure Application Gateway analytics and the Network Security Group analytics. 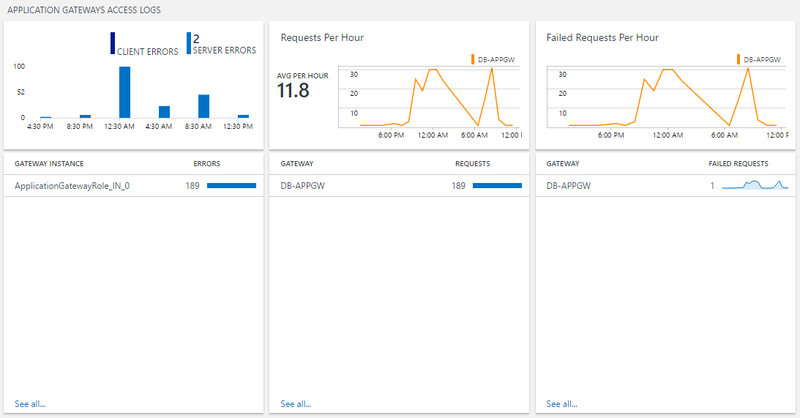 Enable the Azure Application Gateway analytics solution from Azure marketplace or by using the process described in Add Azure Monitor solutions from the Solutions Gallery. 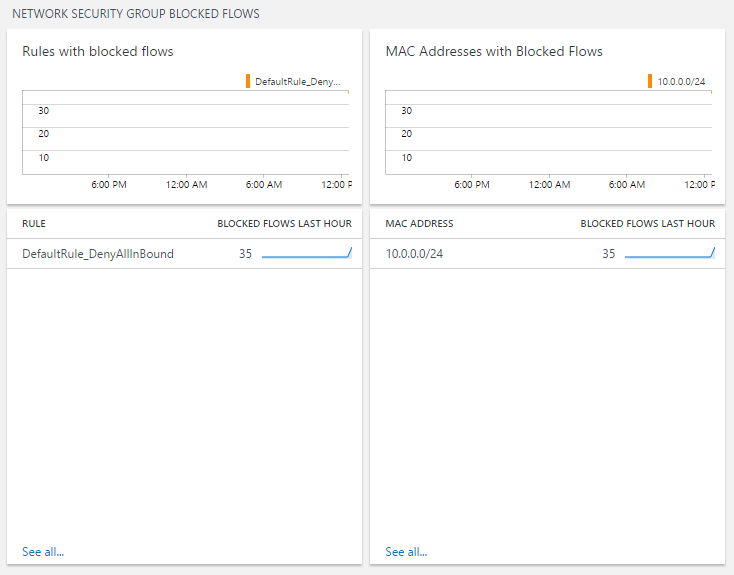 Enable diagnostics logging for the Application Gateways you want to monitor. 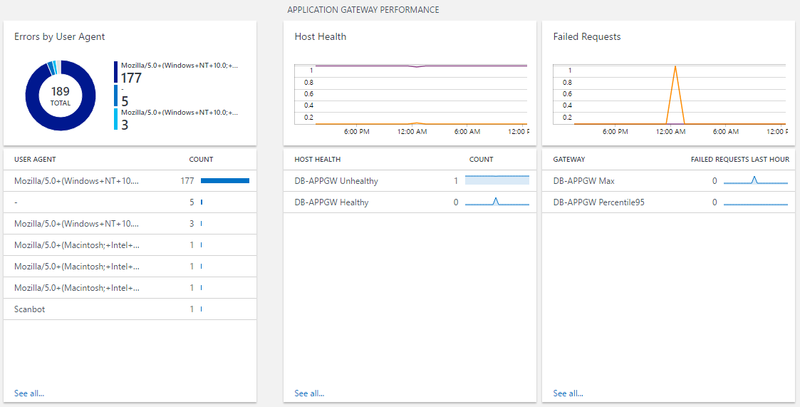 In the Azure portal, navigate to the Application Gateway resource to monitor. Select Diagnostics logs to open the following page. Click Turn on diagnostics to open the following page. To turn on diagnostics, click On under Status. Click the checkbox for Send to Log Analytics. Select an existing Log Analytics workspace, or create a workspace. Click the checkbox under Log for each of the log types to collect. 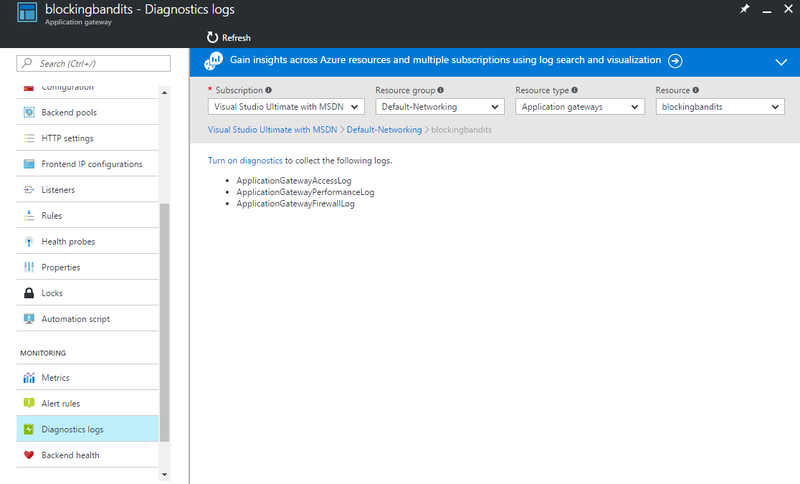 Click Save to enable the logging of diagnostics to Azure Monitor. The following PowerShell script provides an example of how to enable diagnostic logging for application gateways. 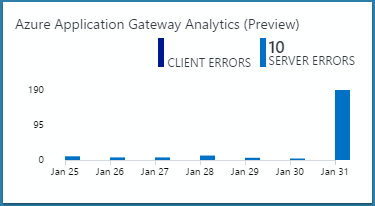 On the Azure Application Gateway analytics dashboard, review the summary information in one of the blades, and then click one to view detailed information on the log search page. On any of the log search pages, you can view results by time, detailed results, and your log search history. You can also filter by facets to narrow the results. The Network Security Group analytics solution is moving to community support since its functionality has been replaced by Traffic Analytics. The solution is now available in Azure Quickstart Templates and will soon no longer be available in the Azure Marketplace. For existing customers who already added the solution to their workspace, it will continue to function with no changes. Microsoft will continue to support sending NSG diagnostic logs to your workspace using Diagnostics Settings. Enable the Azure Network Security Group analytics solution from Azure marketplace or by using the process described in Add Azure Monitor solutions from the Solutions Gallery. Enable diagnostics logging for the Network Security Group resources you want to monitor. On the Azure Network Security Group analytics dashboard, review the summary information in one of the blades, and then click one to view detailed information on the log search page. Type is to AzureDiagnostics. 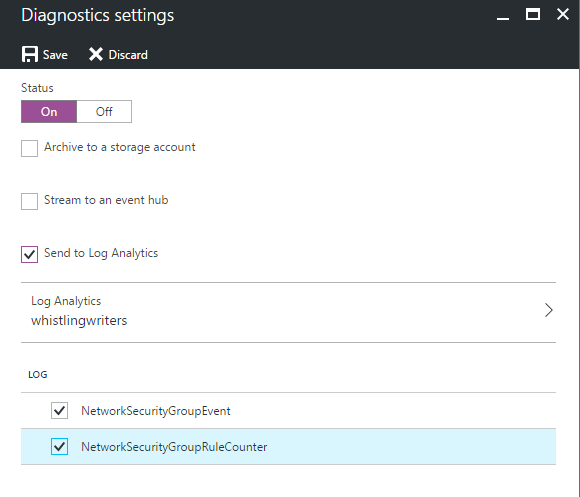 You can use the ResourceType to filter to Azure networking logs. NetworkApplicationgateways | where OperationName=="ApplicationGatewayAccess" AzureDiagnostics | where ResourceType="APPLICATIONGATEWAYS" and OperationName=="ApplicationGatewayAccess"
NetworkSecuritygroups AzureDiagnostics | where ResourceType=="NETWORKSECURITYGROUPS"
For any field that has a suffix of _o in name, the data is split into individual fields based on the nested field names. Remove the Azure Networking Analytics (Deprecated) solution. Data collected before the change is not visible in the new solution. You can continue to query for this data using the old Type and field names. Use Log queries in Azure Monitor to view detailed Azure diagnostics data.